Platform size 6ft x 29in. Can adjust platform from 2ft to 6ft high in 2" increments. 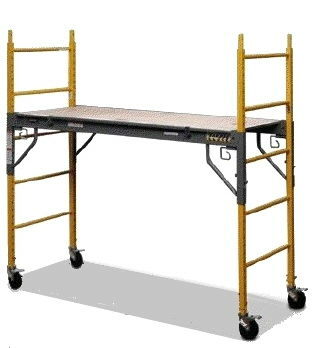 Comes with 5" casters, guard rails, and outriggers if needed. Can go maximum of 3 sections high. Two sections high requires 4 -18in outriggers. Three sections high requires 4 - 24in outriggers. * Please call us with any questions about our pkg multipurpose 1 section in South Chicago Heights IL and Highland IN. Chicagoland and Northwest Indiana with equipment rentals, tool rentals, party rentals, new equipment sales, and parts & repair.